Battle Frog is quickly becoming the OCR Series of choice among discerning competitors in the world of Obstacle Racing. 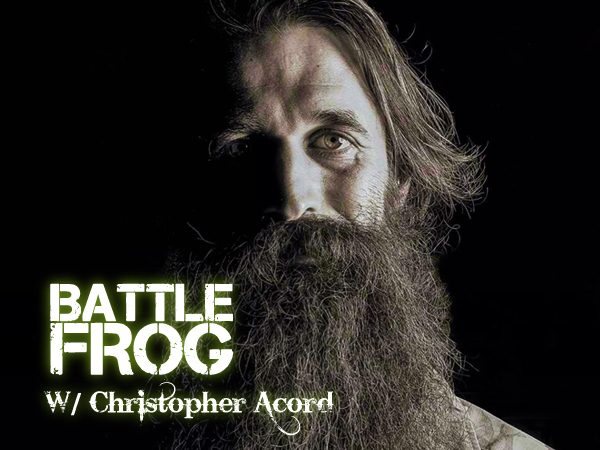 Christopher Acord is Battle Frog’s chief architect/Race Director, fondly nicknamed “The Beard” for obvious reasons. We thought it was time to reach out to Christopher to gain some insight into the planning and development of “the other OCR events”. This interview was highly enlightening and for those who have never competed in a Battle Frog Event, this is clearly a show you don’t want to miss! competitive elite races to be considered completion. I do think this is what you are mostly talking about in this podcast. BUT, the “sport” has become so popular because the masses, including me, enjoy the challenge of trying to do something outside the norm and see if we can improve. The trend in OCR seems to be to keep making the obstacles harder and harder, which is fine and probably necessary at the elite levels. But the events for the most part have the same obstacles for everybody, elites, weekend warriors and beginners. I fear that unless OCR can still have appeal to the non-elite participants, the numbers will drop off and possibly kill OCR’s popularity or make it into another elite sport that only the daring will participate in. I think you have a vey valid point. I know that in other parts of the world they provide an “optional” challenge that is not as intense but may take longer. This seems like a favorable solution for some folks. I don’t have the answer, I am only speculating and hopefully no for the best outcomes for all concerned.